Consumers will now have the ability to share their complaints about financial companies thanks to a new policy that has been finalized by the CFPB. The consumer narratives will be shared on the CFPB website after consent has been received from the consumer, personal information has been scrubbed, and a specified time frame has passed. Companies will have the opportunity to respond with an unstructured narrative response that will be posted along with the consumer complaint. Since June 2011, the CFPB has handled more than 550,000 consumer complaints regarding problems in the financial marketplace (www.consumerfinance.gov). These are currently posted to a Consumer Complaint Database but do not include the whole story. With the new database, consumers will be able to tell the story in their own words, increasing the transparency of the financial marketplace to the consumer and assisting the CFPB with their supervision duties. 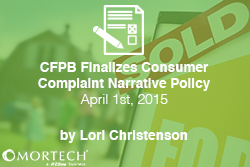 Many in the industry are concerned about the policy announced by the CFPB. The Bureau will not have the ability to verify all the facts alleged and many fear, due to the complaints being posted to a government website, many of these complaints will receive an unjustified level of credibility. This isn’t the first unpopular action by the CFPB. Earlier this year, the new borrower education tool was released, including the Rate Checker tool which many argued may cause more confusion to the consumer due to its inaccurate portrayal of mortgage costs.